It actually all starts with HB Barnum and I playing together in the early 50s. We started off together when we were 11 or 12 years old, under his mother's supervision of course. We played down on 1st and 3rd streets in downtown L.A. because they were hot streets for jip joints to play in. In the late 50s I wanted to expand my musical abilities by learning how to write music. At the same time, I was introduced to another energetic fellow who was tremendously interested in learning how to write music.... Jack Nitzsche. I actually met Jack in Hollywood, in HB's office. [Sonny] Bono and I met a little time after that. Jack wanted to learn how to write so bad! HB was going to teach the both of us. The arranger would write out his scores, then the copyist would rewrite it on onionskin paper. These wound up being the copies for the different musical sections. Jack was always excited about music and eager to learn, so HB helped us by showing us the tricks of the trade! - how to be a skilled copyist, that is. He started out by paying us about $2 a sheet. On a good day I would make $12. Jack was making $50-$70!! So that will tell you how good I was! HA HA. We spent a lot of time together. I was always at Jack's house and we would be doing something musical. Jack had a very sweet and nice wife, Gracia. Jack was always interested in how we could maximize sound and support a singer. Nitzshe had a real strong desire to be a songwriter. We would sit at his house for hours dissecting songs and trying different ways of putting them together. He would ask me..."how do you write feelings?" I introduced him to Hannibal... who was a man with some feelings. So we tried to work out some songs with him. Jack wanted to write for a publishing company and so we sat down and wrote 5 songs. Then he got his first interview as a songwriter. He got the job, and for I think $75 a week he had to give them 10 songs a month. But Jack was able to do it! Amazing! Jack was great. He kept getting better and better and we started to put little demos together with hopeful artists. I would meet people looking for a break, then Jack and I would write out different parts and arrangements to complement their songs and give them a professional sound. Jack encouraged me to start my own production company and later this is something I did. On everything that our company (Star Revue) did Jack was right there. HB was only on our first Star Revue session. Little did I know that Jack, HB, myself and Sonny Bono would set Hollywood back on it heels! Maybe you would like to know how Jack, Bono, and I got together. You've heard of KGFJ in LA? There was a famous DJ by the name of Hunter Hancock. His secretary sometimes partnered him on air. Her name was Margie Williams, yes Tony Williams's wife, of the Platters. 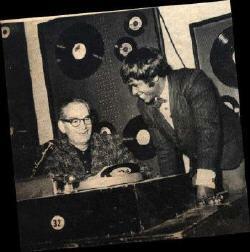 When Jack and I cut our first records we were trying to get airplay. Margie saw that we needed help, so she said she would introduce us to this friend of hers. She gave me a number and said that he was one of the best record promoters in southern California. So we gave him a call and the guy answered the phone in his own nasal way, "hello this is Sonny." We all hit it off right away. From that time on, the three of us were almost inseparable. 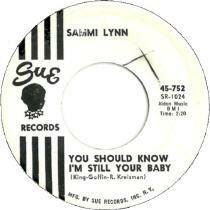 Because Sonny was already making records at that early date (late 50s/early 60s), he had a good eye for talent and ideas, which helped us out tremendously. Every time Sonny was putting together something, Jack and I were there. Little did I know that we all were growing and learning from one another. From '60-'63 we shared the same office. Every day was exciting and fun! Johnny Gambia was Star Revue's second artist and we thought the world of him. I used Jack on the sessions, and he did some unusual things with trombones. Evidently, Jack and Sonny Bono and others, songwriting as well as publishing companies, thought we had done a good job putting that song together. It was the early days; Jack and I worked hard to put the piece together. There were not a lot of label credits, my thinking at the time was, since I owned the label Star Revue, that was enough. I did not need to put Ron Barrett Productions on there. Boy, was that a big mistake! But Jack and I we were becoming a team. Who would have thought, Jack Nitzsche, Sonny Bono, Jean King and Russ Regan would be such major players in the industry that I had the privilege of working with. Even before that we did a down-home session. The way this record came about was that Richard Barry, Don Julian (I worked with and remained friends with Don Julian right up to his death in the 90s) and myself played often together, and after hearing "Louie, Louie" we just put together our club version of that instrumental, no singing. 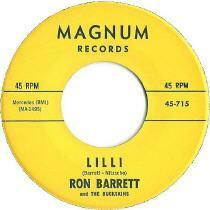 At this time, Lillie Barrett was my wife and so she got the title on the other side. I got some of my close friends together to make this session. Richard Barry was playing electric piano/keyboard, Don Julian on electric guitar, Ralph was one bass, I was playing the drums and Jack Nitzsche was on the set helping us with our chord progressions. We just had fun putting it together. I also remember in the early 60s when Star Revue had parties at the California Club in south LA. We would have Sam Cooke, Etta James, Roy Milton, Bobby Day, Nino Tempo and April Stevens, Hannibal, Jack, Sonny Bono, and somewhere... we have some nice pictures of some of these parties. I personally think that parties like these helped shape Jack's abilities to capture and interpret rhythms and sounds of all types of performers. Jack was always interested in learning, and if he thought he could help you perfect something or work out some idea, he was there to help you. This was getting around Hollywood. In time, a female singer heard about Jack and wanted his assistance, hoping that he would help. It's always good to bounce ideas off of someone and she wanted to do that with Jack. They seemed to get along real well and I used to ask"How's the new girl coming?" He would reply "She's hot, got great ideas, we work good together". So when they were ready to put a song down, I was there and I want to tell you there was some chemistry in the air! They really had this working! What a great session. This girl? Jackie DeShannon. The song? "What The World Needs Now" Their relationship got to the point that it actually challenged Jack's marriage. But they moved on. The greatest thing Jack and I did together was producing for Capitol "It's In His Kiss". Bobby Darin gave me the dub to rework into a sellable piece. 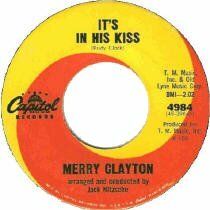 I got The Blossoms, Merry Clayton and Jack (Star Revue had Merry Clayton under contract and never contested when she went to Capitol Records). With Jack's help we arranged the song into a hit. I received no label credit. It was through this that Jack met and worked with Bobby Darin. That production changed the way music was written from that day on. Including the "shoop shoop" hook. Jack and I just clicked when we worked on any project. We had Hal Blaine playing drums, my sister with her Blossoms, Merry Clayton singing lead, and of course yours truly... We couldn't miss! Bobby Darin was actually the one who got the session with Capitol for us. For a while it looked as if Bobby was going to join our rat pack of Sonny Bono, Jack and myself. Fast forward to Ron 'Ringo', 'the American Brown Beetle' and The Originals. [Thinks] What did I do next? Star Revue came up with two of the greatest ideas we ever had. Firstly, we coined the phrase, as well as recording the very first drug prevention record, "Please Say No". That was picked up by the then first lady Nancy Reagan. Secondly, we are just finishing the new slogan for "America". The CD will be complete shortly. "The record shows it came out in 1965 but in 1963 that is what I remember."